Gist: Find your internal motivation to build strong systems and drive results. When you control what motivates you, inspiration is more reliable and routines stick. I was talking to a friend about exercise recently. It can be so hard to get into any kind of rhythm. Productive routines are difficult to build. You want to be more reliable and accountable to yourself, but it’s damn hard to make the time in your busy life. You might try a few routines at home or at work you think are productive, but they don’t stick. So, you decide you just don’t like them. Routines don’t work for you. They aren’t just a formality. My trail buddies and I really do enjoy running. And the reason we enjoy it is because our motivation to do it comes from inside of us. If you’ve ever struggled to stick to a routine, the solution could be as simple as channeling your motivation from the right source. Here’s how to do it. A professional can instantly tell if their patient will get clean and stay that way. Everyone who overcomes a drug addiction is motivated, but the ones who succeed long-term are the ones who are motivated for the right reasons. Research shows rehab success lasts when patients are motivated to make themselves better… for themselves. That example illustrates the difference between internal and external motivation. When you’re externally motivated to change, the things that drive that change are outside of you and, therefore, outside of your control. For an addict in rehab, it could be the loss of a relationship, a job, or something else. For you, trying to build routines to save time or improve yourself, the motivation could be similar. Maybe your partner has been nagging at you to get healthier, so you try to build a fitness routine. Or maybe your boss mentioned you’re not as productive as you should be, so you’re trying to organize yourself at work. The data says that, if these are your motivations, your efforts probably won’t work. You’ll get started. But when things get difficult, you’ll give up. And things always get difficult before they become easy. External factors change, you can’t control them, and trying to keep up with them proves useless over time. But when you’re internally motivated, you’re driven by a desire to make yourself better. You’re only accountable to you, and that means you control the variables that decide whether you succeed or fail. When those factors are stacked in your favor, the odds say you’ll make lasting change. 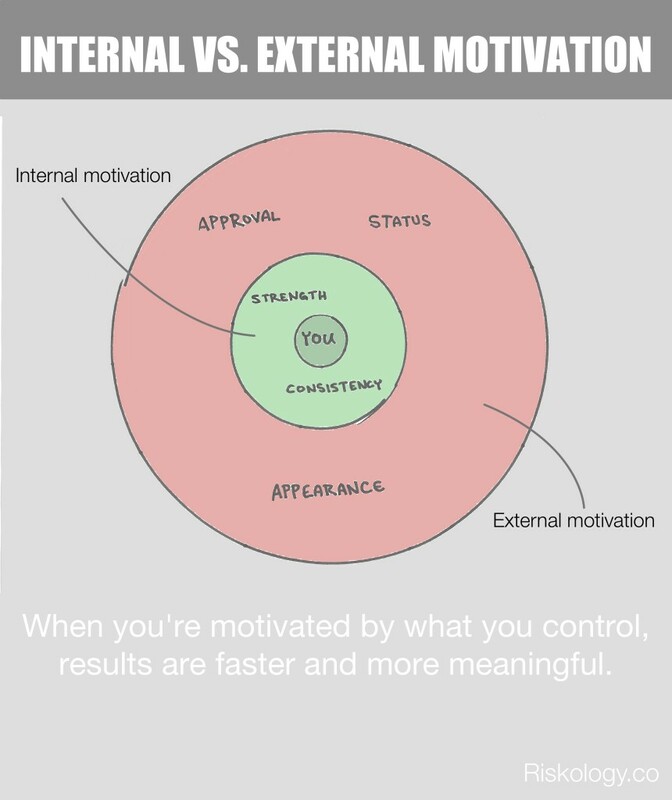 What’s more interesting: the external motivations that drive you are often better satisfied when you ignore them and focus on finding your internal motivations and acting on them instead. Consider an example. Let’s say you’ve been told by your boss that you don’t contribute enough to your team brainstorming sessions. You’re too quiet, and it’s going to keep you from getting promoted. If pleasing your boss and being promoted are your primary motivations to improve, you’re going to struggle. You’ll take the feedback and try to speak up at team meetings. But it’ll feel unnatural and you won’t express yourself well. This is the folly of external motivation. You’re allowing someone else to determine what’s good for you and taking actions to fix it for them. That’s not sustainable. But what if you took that feedback and looked a little deeper? Maybe you have a real desire to be influential, and that feedback from your boss shows you that you’re not rallying your team like you could be. That line of thinking—focusing on an internal motivation—will lead you to different solutions to the same problem. Maybe you’ll make more time to have one-on-one conversations with your teammates or build a routine of reaching out to your colleagues via email or chat to discuss ideas as they come up. These routines will be sustainable because you built them from a desire to please yourself instead of someone else. And, at the end of the day, your boss and your coworkers are going to get what they need as well. Let’s face it. We’re all externally motivated to some degree. If you struggle to build systems and routines that will become a part of your life and produce the lasting changes you hope for, the trick is to tilt the scale just a little. Find the internal motivations that will produce those external results. Focus on change you feel instead of change you see. Exercise and health are a good example. Everyone wants to look great, but the only reason to look great is so that others will like what they see. If you want to improve your appearance, go a little deeper. Instead of making your looks the prime motivator, focus on increasing your strength, becoming more agile, and building more stamina. These are things you actually control. As those metrics improve, so will your appearance. The idea that you can do something you hate over and over until you like it is a fairy tale in most cases (read on to learn when it isn’t). You might succeed at first, but it’s excruciating. And the resentment that slowly builds will eventually cause you to fail. You’ll lose the progress you made. Instead, have the discipline to only focus on doing things you enjoy that will also produce the results you want. This is what it looks like to be true to yourself. Consider the example from earlier—the quiet employee who needs to become more influential to move up in their company. There’s a swimming pool’s worth strategies and tactics they could try, but long-term success comes when they find the teaspoon of strategies that are the perfect fit for them. When you start a routine, don’t give up for at least 30 days. When I started running, I didn’t like it that much. I was overweight, out of shape, and not very good at it. But I wanted to give it a fair trial, so I stuck with it for a few months. Tens of thousands of miles later, it’s one of my favorite activities. Don’t give up on something important to you just because you’re not good at it. And don’t convince yourself that you don’t like it until you’ve become proficient and still don’t like it. It’s hard to like something you’re not good at. It’s not much fun until you know what you’re doing. If you commit to trying something new for at least 30 days, your skill will improve. As you improve, you might learn you actually like it. You have more control over how often you do something than the results you get from doing it. And results come from consistency, not the other way around. These are the primary factors in building a routine that is a natural part of your life instead of one you struggle to implement over and over. When you let your internal motivations guide you, the results you get won’t just be better, they’ll be more fulfilling.